Dozens of volunteers were working along Memorial Drive in Calgary on Saturday, erecting the annual Field of Crosses Memorial Project. In total, 3,400 crosses are being displayed this year on to memorialize Southern Alberta soldiers who were killed in action from the Boer War through to Afghanistan. Each cross is inscribed with the name, age at death, rank and date of death of a soldier who lost his or her life. “That tells you that Calgary is a city where the folks remember, who don’t take their city for granted. 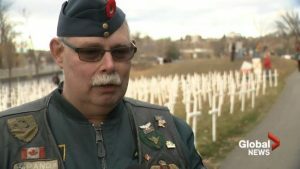 Somebody paid the price and of course we are the ones who were getting the rewards,” Murray McCann with the Field of Crosses Memorial Project said. Dan McLean was an air navigator with the RCAF during the Cold War, tracking Soviet nuclear submarines from the air. “It was a really important job and you felt really good doing it but you were apprehensive on what might happen. But it didn’t happen,” McLean said. McLean joined the dozens of volunteers erecting the crosses on Memorial Drive. Like the soldiers who fought in World War I, “the war to end all wars”, McLean thought that the end of the Cold War would put humanity on a new path to peace. “We thought when the Cold War ended that we were going to get the peace dividend and the world was going to change,” McLean said. For those who saw first-hand how close the world came to destruction during the Cold War, the latest threats of nuclear weapon use is disheartening. “We know how bad it is. We know how many weapons there are to destroy this planet. Hundreds of times over. And we know how ludicrous it is in so many ways. I couldn’t imagine the mess the world is in right now,” he said. But when it comes down to it at the end of the day each individual has to make a difference, has to change the way they think and has to be kind to people,“ McLean said. It is estimated that more than 4,000 Southern Alberta men and women have been killed while serving in the Canadian military in combat or in peace keeping missions. The number of crosses has increased each year as more research identifies more names.